The fine folks at Wimberley – famous for amazing tripod heads and superb macro arms – sent me a Plamp II with accessories to review, and now that I’ve had a chance to use it for a while I thought I’d put my thoughts online. In summary, it’s really very good, and almost exactly what the vast majority of macro shooters want. I was also lucky enough to make a very simple improvement that for me made it better. A Plamp (“stands for PLant cLAMP“) is a macro photography plant holding tool that allows the photographer to keep stems rigid, by holding the stems still with clasper clamps. Packaging is perfectly good, as you’d expect – it comes in a box with instructions, so really, what else can you ask for. The product itself is about as intuitive a product as I’ve ever come across, and you don’t need to be a rocket scientist either to work out how to use the Wimberley spike accessory, which is a clever device that allows you to mount the plamp straight into the ground rather than on a tripod leg. A Plamp: What Is It? 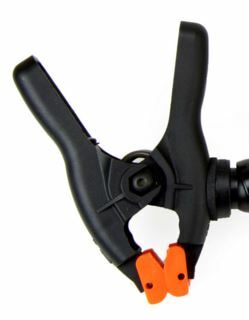 The Plamp II has two sets of clasper clamps, the fine set that holds the stem and a stronger, bigger orange one for Plamp II support onto a tripod or spike. On the Plamp II, the strong bottom orange clasper clamp – the orange and black clamp – works fine, it fits snugly onto the spike as it should, with no slip or give. I very much like the fact that the blurb says the spring tension is adjustable although I can’t claim to have tried it yet myself. Also, important, the bolt that holds the Plamp II onto the tubing is wide and strong and is a big improvement. I’ve found that because of the awkward rounded moulded shape of previous clamp component, the bolt that is usually used to hold such a clamp onto loc-line isn’t quite wide enough, and this becomes a source of looseness as these nut and bolts slacken over time. My other Plamp derivatives are actually all a bit floppy at the base now. On the Plamp II there isn’t such a problem because the loc-line tubing is attached differently, using a better fitting. The flexible loc-line tubing length is the for me the Plamp II’s weakest point for me, as it’s actually so stiff that it’s hard to smoothly micro adjust. When I’m positioning the fine flower clamp head next to a plant, and want to grasp the plant, the tubing is stiff and resists movement, you have to give it a bit of a firm push, and that push often moves it more than I’d like. So I do find micro adjustment more awkward than I’d like in the ideal product. That said though, Wimberley responded to this comment by adding another accessory to their Plamp II range, a Plamp II clamp extension, which is just the fine head on a rigid length. The rigid length is mounted in the original Plamp II fine head, and allows for easy micro adjustment. Think an additional fine head (like the pic below) on a rigid plastic length (like a lollypop), and the rigid plastic fits into the original fine head, so is easily adjusted. The fine head clamp component is superb for flowers and stems, close to perfect. It’s very easy to micro adjust and clasps the plant perfectly. On a perfect system the foam jaw insert might be a little longer for me, as in wider across the jaw’s length, but all in all it’s prettymuch spot on, especially the fact it’s a foam jaw so it clasps gently rather that harshly. The notch for diffusers doesn’t really work for me at all – but then I don’t use commercial diffusers for macro but have my own pieces of card. Big floppy circular commercial diffusers are a bit of a waste of time as they just flop and get in the way and they’re generally just too darned big. They’re large so there’s no room to hold them under a subject, which means that you have to put them distant, the other side of the tripod, so you lose a lot of that bounced light. I prefer a small light “cake-bottom” card (10×10cm) very close to the subject rather than some huge thing 50cm away. What I mean by “cake-bottom” card is heavily crinkled aluminium-foil covered cardboard base (makes the cake look pretty), and I like to use those – you can’t beat small light and cheap. Even if I wanted to though I couldn’t use the Plamp II to hold it – my circular reflector has quite a wide edge (1cm) which wouldn’t fit in the notch. And I’d suspect, too large a “sail” – in the field the wind would catch it and make it unsteady. And heavier than the Plamp II would probably like. Overall the Plamp II does a great job and as a generic product it’s absolutely perfect for 99.9% of macro enthusiasts. That said, I’m in the other .1%! I do field stacking with a Cognisys Stackshot which moves the focus plain by 1+ micron increments. Absolute rock solid steadiness and the ability to micro adjust when composing are both critical for my stuff. The Plamp II spike accessory is clever – it’s just a screwdriver in a tall plastic cap, but a smart simple addition, and well designed for ease of packing. And avoids camera vibrations by not attaching to the tripod. In truth, for my use I did find both the screwdriver metal and the handle to be a little shorter than I’d have liked, I like it a bit deeper for firmness (especially near water where soil is wet so less firm). 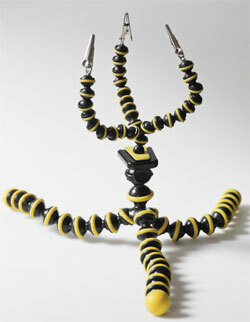 But again, a very useful accessory for the macro photographer. A bit of physics: any plamp device, being a “one long arm” design will always be prone to “arm pendulum oscillation” vibration, especially as the length of arm increases, and I did find this to be the case. This will also be the case with 2 Plamp IIs, one either end of the plant/stem, as they’re still individually long oscillating arms with the plant clamp element at the very end – the point where any oscillation is always at its maximum. And, where I am in England, being an offshore island between an ocean and a continent, does seem to have a tediously mildly windy climate – and whilst I personally live well inland in a valley far from the sea, there are just about always annoying 2-5mph breeze flurries that will oscillate the subject and I can’t have that. But I did cure it, it’s actually ever so simple. If you look at my macro holding tools page the blue plamp-like thing I illustrate there is shorter and actually has two of the big orange and black clamps, one at either end. I found that by using the Plamp II to grab the plant, attached on my Stabil macro tripod (onto the inner splines of the forward legs positioned vertically), I can then also attach another of my blue Plamps immediately above the Plamp II tripod clamp on the spline, and then use the other end of my thing to clamp onto the tubing of the Plamp II itself – as near to the flower clamp end as possible. This makes the whole arrangement immediately an order or magnitude better, because my addition provides a rigid “cross brace” so that oscillation vibration just won’t occur. I’ve found this invaluable. And on another note, the inner spline of a Stabil tripod is quite narrow and thin, and the Plamp II only barely manages to clamp it, and only if I clasp the width edge rather than its side. This works for me and maybe it’ll work for you, worth a shot. John Hallmén’s DIY plant stem holder, the epic Gorillazilla, is more or less the best out there at the moment, although it doesn’t do 2 more rotation degrees of freedom which I’d personally ultimately like to add. It’s proving difficult – the components I’m after don’t seem to have been invented yet. For the perfect contraption for me, in terms of parts there’s the support component (ie the legs) and the clasper component. For the support component, although I could use a cheap old tripod, I’m quite attracted to the idea of a rigid but light studio rod system that can be added to each other by screwing them together, with some sort of 10 cm diameter circular base component (big pad so it doesn’t sink in wet ground) that also screws in. The Novoflex rod set looks like a suitable candidate. But the big pad base should have holes at the edges so that I can insert aluminium tent hooks through for extra stability if I want. With an option to quickly substitute the pad foot with a ground spike foot. My working height ranges from ground to 1.5m, and whilst in cases of the taller shoots it’s easier to just snip off the grass head and clamp it lower down, this can disturb the bug, and in the case of a protected plant, it’s just not something you want to do. So variable height is nice. The rod setup needs to have some bits of ‘rod coupling’ plastic that will allow me to add a couple more thinner rods where I want and use them as cross braces, straight down into the ground at an angle, each with a 30 cm spike, at 90 degrees to each other. Ie looking down the main height from the top, at midday and 3 pm respectively. That would create a nice brace. The bits of ‘rod coupling plastic’ should be able to move up and down, and be easily tightened with a single turn of two independent screw tightener handles. The bits of ‘rod coupling plastic’ should also not be a full circle but say 60%, so the cross braces can be popped in easily and quickly, as a completed setup step before starting on the plant clasping steps. Setup to this point should take <1 minute. For plant claspers I’d like to have a couple of arms coming off the main rod, obviously attached in a very flexible ‘up and down along the support component’ way, so I can move them up and down easily. It’d be lovely to have a sesitive microscope-like rack and pinion controls on both of these to move them up and down, like the controls on my bellows, but that strikes me as a bit unlikely on studio rods. So I suspect they’ll just attach with pressure tightening. In terms of these arms I suspect that I’ll have to end up buying some sort of superior absolutely no-give/shake/rebound microphone gooseneck as the arm for the claspers, which should allow very precise adjustment, but keep steady as well. Hopefully they don’t need to be long – just 6 inches or so – the longer the neck, the more any potential oscillation vibration. And a double arm mechanism like above if single doesn’t cut it. The claspers would ideally be something like the ones on the Plamp II, ie a screw that you can use to tighten and loosen the jaw. Maybe the screw knob could have a bigger diameter face so micro adjustment is easier. Goosenecks are suprisingly difficult to find, although this site looks promising. But! the clasper needs to have a party trick up its sleeve, an additional ability to rotate to the PlampII head, on another axis. As in, in order to make it better than anything that exists today, I not only want to clasp the plant stem but I also want to be able to rotate the stem along and about the stem’s axis. This is the bit that’s still defeating me – even the amazing bits site McMaster Carr doesn’t seem to have a component that can achieve this for me, a ‘clasping rotating jaw’. The nearest product I’ve found is a fly tying vise, but these are designed for the hooks of fly fishing so the super thin clasper jaw designed to hold a small hook rather than a 1cm wide stem. That said, that is a minor (but surely solvable) issue. Beyond that, micrometer rotation stages exist aplenty – I have one – but they don’t clasp. Also, in terms of the clasper, I should imagine that a ’2 halves of a one inch long tube with foam inside that you use a rotation wheel to bring together’ type clasper would work better than a jaw mechanism – longer length of support – but I have not found that either. The system I describe is quite handy because different claspers for things like diffusion, reflectors and flags would be very easy. But unfortunately it’s also rather unlikely to ever to make it to market because of the approximately 10 people that would buy it worldwide. The cool thing about working with Wimberley is that the R&D guys there are taking a look at this idea, and seeing if they can come up with something. It’s a bit of a tall ask and I know R&D takes time, but let’s hope they come up with something cool! Lastly, I’d like to thank Wimberley for reaching out to me to let me test their product. What really impresses me is that they’re using my criticisms to try and make an even better product, which can ultimately only benefit all of us. The perfect universal joint in the field.? Magnets might be the solution. They have solved a few positioning problems for me. while the arm terminates in a ring magnet of slightly larger diameter. spherical magnets might drill more easily. I have got one of them goose necks, albeit I never intended it to hold the subject, but additional light or reflector cards. It bends alright in every direction, but you've got to bend it much further than required for it flexes back quite a lot when you release the pressure. Not suited for exact positioning so. I also got a much thinner one that I made from a usb-led lamp - I removed the usb connector and replaced the LED with a croc clamp. For light weight subjects, this works much better, but nog good enough for macro. The best solution so far still is a microscope table vertically mounted on a block of wood. The clamp is attached by a strong magnet to it, so mounting the subject is done with the clamp detached. However, it still needs improvement on long vertical distances and on turning the subject.